I'm back with another couple of reviewletts today! This is just how lazy I am about writing indvidual reviews for books. But don't you think it's a good idea sometimes? It helps us get caught up AND we can say our peace about books that may not have blown our skirts up. While both Tell the Wolves I'm Home and The Untertaking of Lily Chen had their charms...overall, they did not blow me away. 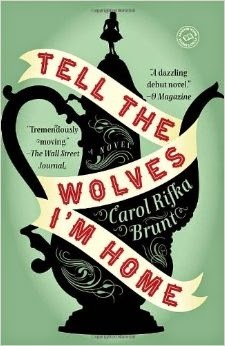 Tell the Wolves I'm Home, by Carol Rifka Brunt, has been a huge success. I can see why! There were parts of this novel that I loved. I adored the story of June and her beloved uncle Finn. I wanted to scratch her sister Greta's eyes out on a regular rotation. I enjoyed the inclusion of art and a specific, and very important, portrait. It made me cry on occasion, even. But I think the amount of attention given to this book left me a little bit cold. I didn't love the writing and closed the book with a "just ok" feeling. I read this one for the #EstellaProject Season 2. 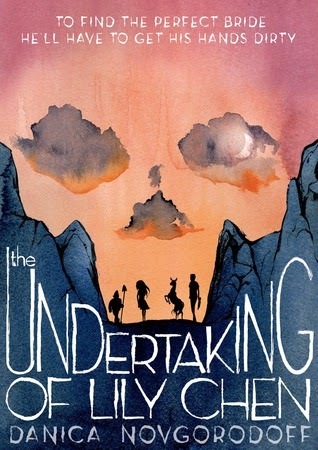 The Undertaking of Lily Chen, by Danica Novgorodoff, is a graphic novel I've been itching to get my hands on. the artwork is obviously gorgeous. Just look at that cover! The premise is one that caught my attention, too. After his brother's death, Dei sets out to find a corpse bride for his sibling so he won't be alone in the afterlife. He's willing to rob graves or perhaps even commit murder to fulfill his promise to his family, and that's where the lovely Lily comes in. Estranged from her family, she sets out on the road with Dei without a real understanding of what he's after. Twists and turns ensue. While the artwork was superb, the story was predictable and left me wanting a bit. Have you read any books lately that held great promise but didn't quite pan out the way you'd hoped? Share! Sorry these books weren't all that you wanted them to be. I'm still hoping to read the Rifka at some point if i can get my ARC addiction under control. I'll be posting about Wolves soon. I read it for my book club - the member who recommended it said it's the best book she's ever read. I went into it with VERY high expectations that it wasn't able to meet. Get this, that same member recommended the book again last month! Interesting--I've heard so many people recommend Tell the Wolves, but to be honest, I haven't been motivated to pick it up. The description hasn't really pulled me in. I have gone round and round about Tell The Wolves. I felt like I "had" to read it. Now, not so much! I wasn't blown away by Tell the Wolves I'm Home either. I thought it was good, and I did really like the relationship between the two sisters... but on the whole it just didn't grab me. I don't even know that it was a case of too-high expectations as much as it just wasn't my kind of book. I'm actually glad to hear that about Tell the Wolves. I've been on the fence about it, because everyone loves it so much. Now, if I read it, my expectations will be adjusted. I still want to read Undertaking Lily, if only for the purdy pictures! I loved Tell the Wolves I'm Home, but wasn't blown away by The Storied Life of A.J. Fikry... which everyone else seems to love. I could totally see how too much hype could get in the way of Tell the Wolves I'm Home. I don't think I knew much of anything when I went into reading it, so I was very pleasantly surprised. Gah I feel like I am partially responsible for over-hyping Wolves, but I went in with no expectations and my socks were blown so far off I haven't seen them since. I really liked Tell the Wolves I'm Home, but now that some time has passed, I know it won't go down as one of my all-time favorites. The one book that let me down recently is The Girl You Left Behind (Jojo Moyes). I loved Me Before You and was expecting another stellar read, but came away from it with a ho-hum feeling. Too much hype! I think Tell the Wolves I'm Home really got to me because of June's wandering around the forest pretending she lived in medieval times. I loved that! I just wanted to hug her so much for sharing that.